Last night we had a post in this space describing a conspiracy of sorts among Republican members of the Louisiana House of Representatives who are discussing a plan to de-fund the TOPS program in this current regular session. As the post described it, to reduce TOPS’ funding to zero would bring the state budget fairly close to balance from its real deficit – after the House Appropriations Committee gets through making cuts to the budget sent it by Gov. John Bel Edwards – of somewhere around $350 million, and therefore create the kind of leverage that would allow for a simple resolution of the issue in a special session to follow. The budget gets balanced on the backs of TOPS parents, and then there is a tax increase passed in the special session, probably a renewal of a quarter-penny of the state sales tax rolling off the books in July plus the removal of some sales tax exemptions, which would fund TOPS. This is absolutely an idea which has been discussed at the Capitol. It was discussed during the special session prior to the start of this year’s regular session and for a time it appeared it would actually happen. But it didn’t, mostly because the Legislative Black Caucus demanded that no tax dollars be dedicated to TOPS and also that the tax increases the legislature passed be income tax increases and not sales tax increases. Those demands scuttled a deal House Speaker Taylor Barras was attempting to broker with Edwards. It would be a surprise to no one if this idea resurfaced as the state’s budget moves closer to passage. But yesterday’s post by Charles Keenan asserted there was an active plot afoot and named names of Republican House members supposedly involved in it. I let the post be published despite being queasy about those names being named. Keenan was adamant that he had sources backing that list up. We are constantly confronted with false stories that appear to be news. The most recent fake news in Baton Rouge comes from a habitually low-quality internet blogger trying to stir up trouble over TOPS funding. Really, the National Enquirer in the grocery store checkout line has more journalistic credibility (“Hillary Clinton Adopts Alien Baby”). This blogger relies on unnamed sources to create a conspiracy theory that legislators at the Capitol want to defund TOPS. Not one of the legislators accused of this fantasy were contacted to verify the claims made by the unnamed sources. The fact is that many legislators support higher education and want to ensure long-term stability for TOPS, which has historically served over 800,000 students and currently benefits about 50,000 students. Either the unnamed sources or the blogger, or both, want to spread a knowingly false story to further their own political fairy tales. On one level it’s fair to say the lady doth protest too much. It isn’t a fairy tale to suggest Paula Davis could be involved in discussions about de-funding TOPS and then raising taxes to re-fund it. After all, in 2016 Davis did exactly that, voting for an amendment by Rep. Katrina Jackson (D-Monroe) which would have stripped TOPS money out of the budget and funded rural hospitals instead. At the end of the day that question was made moot by the raising of sales taxes to fund both. Many of the other names on that list also voted for the same amendment. That includes Reps. Mark Abraham, Steve Pylant, Rob Shadoin, Tanner Magee, Zee Zeringue, Larry Bagley, Stephen Dwight and Bubba Chaney. It would have been entirely fair to say that any plot to de-fund TOPS in preparation for a tax increase to re-fund it would seek out those House members because of their past voting record. Unfortunately, our post did not read that way, and amid the protests I pressed Keenan as to his sources for that list and was not satisfied with the answer. The post also included Reps. Julie Stokes and Steve Carter as supposed conspirators in the TOPS scheme. In Stokes’ case it’s fairly widely known she’s had conversations with the governor’s staff on ways to raise taxes – and she’s publicly stated on several occasions that she believes Louisiana has a revenue problem rather than a spending problem. But upon investigation I’ve seen no reason why Steve Carter, who has pursued gas tax increases to pay for roads and is otherwise not active in attempts to de-fund TOPS to my knowledge, should have been on the list. Accordingly, we at the Hayride are removing the post. And it’s with regret that we announce Charles Keenan won’t be writing for us in the future. Credibility is crucial to our survival, particularly with respect to matters at the state legislature our readers count on us to provide accurate information on free of the left-wing media spin, and therefore we want no part of a controversy arising from overaggressive reporting. As to the underlying idea, that TOPS be de-funded and then dangled as bait for a tax increase, we find it abhorrent. TOPS is one percent of Louisiana’s budget. It’s certainly not the most wasteful or inappropriate one percent of that budget. 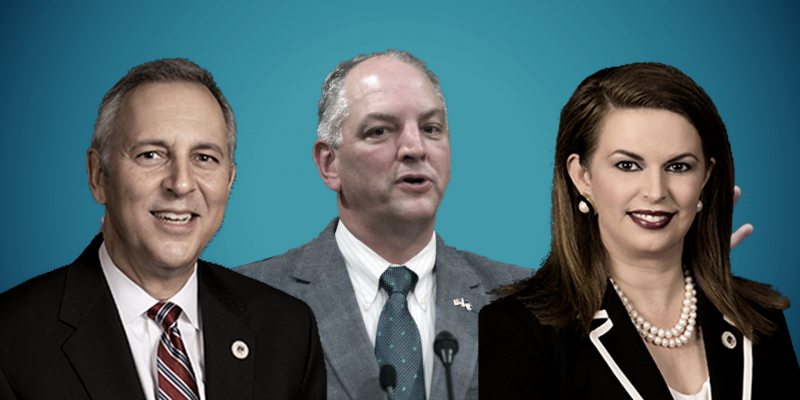 Edwards and the legislature can find something else to cut rather than to break a promise made to the young people in Louisiana who are actually achieving something. Any Republican suspected of going along with such a plan is best advised to come clean and repudiate any involvement with it. And we commend Davis for doing just that yesterday. As we do her colleagues who are also publicly denying involvement in efforts to de-fund TOPS.